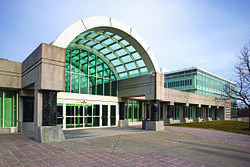 The George Bush Center for Intelligence is the headquarters of the Central Intelligence Agency. An intelligence agency is a government agency responsible for the collection, analysis, and exploitation of information in support of law enforcement, national security, military, and foreign policy objectives. Means of information gathering are both overt and covert and may include espionage, communication interception, cryptanalysis, cooperation with other institutions, and evaluation of public sources. The assembly and propagation of this information is known as intelligence analysis or intelligence assessment. Defense against the efforts of other national intelligence agencies (counter-intelligence). 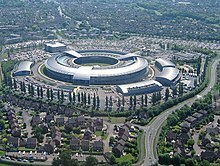 There is a distinction between "security intelligence" and "foreign intelligence". Security intelligence pertains to domestic threats (e.g., terrorism, espionage). Foreign intelligence involves information collection relating to the political, or economic activities of foreign states. Some agencies have been involved in assassination, arms trafficking, coups d'état, and the placement of misinformation (propaganda) as well as other covert operations, in order to support their own or their governments' interests. ^ Szoldra, Paul (May 11, 2013). "These 17 Agencies Make Up The Most Sophisticated Spy Network In The World". Business Insider.